Home >> 101 Questions Series >> Can I use laminate flooring on walls? Yes, you can install laminate flooring on walls! Laminate flooring on walls has become a popular trend in homes and businesses. Not only is it a unique way to bring incredible style to any room, but it’s affordable, which makes it a win-win. It can be easily installed on walls and can create a rustic, modern or unique feel. The installation process can appear intimidating, but with preparation and the below information, you will have a creative new look in no time. Below you will find everything you need to know about bringing this design style to your own home or business, including a list of supplies, step-by-step instructions, and a video tutorial. As always, you can call us at 1-800-520-0961 or utilize our online chat if you need assistance or have additional questions. The installation process is very similar to installing laminate on your subfloor, however, the planks must be permanently attached to the wall so they stay in their place. It is important to remember that you still need an expansion gap when installing on your walls, as the material will still expand and contract with changes in temperature and moisture levels. Below you will find step-by-step instructions on how to install flooring on your wall. You may also refer to this video by Armstrong flooring for a visual representation of the steps listed below. Measure the height and width of your wall in order to determine the amount of flooring you need. As with floor installations, you will need to purchase 5-10% extra flooring to allow for errors as well as cutting pieces to fit. Prior to installation, you will need to allow your flooring to acclimate to the temperature and humidity of the room. You can do this by removing the planks from the box in the room you are installing them in. Always refer to your manufacturer’s guide to know exactly how long your particular flooring needs to acclimate for. You will need to make sure you have a 1/4″ expansion gap around the entire perimeter of the wall. As I mentioned in the tools and supplies list, you may want to purchase 1/4″ shims in order to assure you have a proper expansion gap. You will need to use a stud finder to find the studs in your wall. Once you have located them, you will want to mark their locations with a chalk line. Next, you will want to lay out your planks on your floor to get an idea of how they are going to look on your wall. You can arrange them however you feel is visually appealing. For a more random, natural look, you will want to make sure the end joints of adjacent rows are staggered at least 6″ apart. You will also want to avoid allowing plank ends to align. You may need to rip your first row of planks to assure everything fits nicely. Ripping a plank means making a straight cut lengthwise. Once you have your planks laid out how you want, it’s time to begin your install. Prepare to do this by loading your nail gun and by cutting off the tip of your construction adhesive and placing it in the caulk gun. Apply your adhesive in a serpentine pattern (a repeating letter S) to the back of the first plank of the bottom row. Place the plank on the wall above your expansion gap and face-nail the plank at the stud location. Make sure the nail is low enough that the trim will cover it. You are going to then blind-nail the plank through the groove at the stud location. Repeat this process until your first bottom row is complete. Since only the planks in the bottom row get face-nailed, you will go straight to blind-nailing through the groove at the stud location for the rest of your installation. 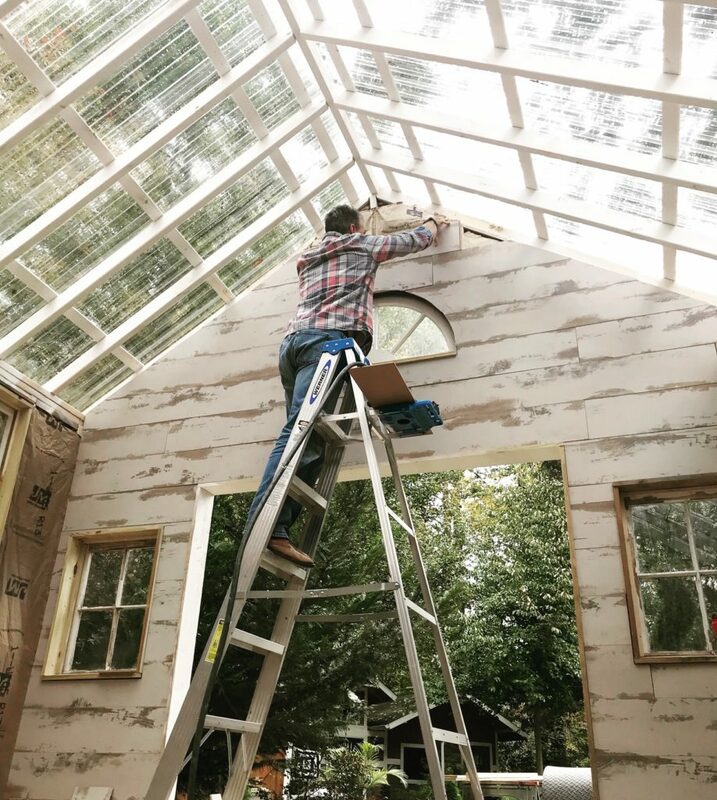 Continue to apply the adhesive to your planks in a serpentine pattern, use the angle-angle installation method, and blind-nail as you continue up the wall. You may need to rip the last row of planks in the same manner that you had to rip the first row. Do not forget to leave that expansion gap at the top. Lastly, add trim work to create a finished look. This installation guide is based upon installing laminate on your walls. The installation wall should be primed or painted drywall ONLY. Make sure you DO NOT install directly over wallpaper or paneling. As mentioned above, always refer to your flooring manufacturer’s guide for acclimation information, installation information and proper care instructions. Expansion gap, expansion gap, expansion gap! This is so important when installing flooring whether on the subfloor or on your wall. Do you have additional questions we can answer? We will be happy to help. Post your question below this article. You may also browse our wide selection of laminate flooring remnants for your laminate wall project. Id like to install vinyl plank interlocking flooring on a thick plywood or composite, particle board. This board would be a wall btw room and closet. I guess id nail it down, maybe w the help of a glue?. But if secured like that why would an expansion gap be required?. I didn’t mind adding the gap, but just trying to understand. Also what type of nails? And what type of adhesive? Hi Ron, for that application, it looks like a polyurethane or silicone adhesive will be best. Your local hardware store should be able to give you some recommendations! What about laminate with an attached pad on the back? How would you go about installing this? Would you be able to still use adhesive and would it still bond the attached pad and the wall? The laminate I am looking at comes with the attached pad already on it. Hey Nate, I have a feeling you are not going to like my response. Unfortunately you are going to want to remove the pad firstsince the attached pad has a glue already and could come apart. Also you would still want to glue it directly to the wall and still nail it. Hi, I want to create a laminate accent wall using different colors. I know I need to buy from the same manufactuer but does the planks have to be the same thickness? Hi Jennifer, thank you for reaching out. In order to interlock the planks, they honestly need to be from within the same line of flooring, not just the same brand. This would end up meaning that the thickness needs to be the same as well. I would like to install laminate in the kitchen as a backsplash. It would be going over 1″ x 2″ ceramic tile. Does the tile need to come down? Also, some sites talk about whether a particular laminate is suitable for a vertical installation or not. Others do not make that distinction. If there is a difference, what makes a laminate suitable (or not) for vertical installation? Hey John! Thank you for reaching out. If the laminate flooring is meant for a floating installation, there is not going to be any specific install for that purpose. Also, laminate is not water proof – so that would be a slight risk for that type of install. Hey Pam! Great question. If it is meant for a floating application, adhesive is not necessary. I would recommend contacting the manufacturer directly to determine if it is acceptable, that way you can avoid any warranty issues. can you install laminate directly on to the wall framing , no drywall The framing is 16 inches on center and fully insulated with vapor barrier. Hi Roy, thanks for reaching out. You can go ahead and install laminate directly on the wall framing. We recommend using a nail gun and adhesive on the studs to ensure the flooring is well secured. Please let us know if you have any other questions! How about installing in a rv. I want to put on one wall in the living room. I did put vinyl planking on the floor and love it. I don’t like the weight of laminate, but. Please give me your thoughts. Hi Rodney, thanks for reaching out. When installing any flooring on the wall, the most important factor is to make sure that the flooring is secured properly so it doesn’t fall off. When installing on a regular wall, you can nail planks directly into the studs in your wall. In an RV, we assume there are no studs, so the only option is to glue the flooring to the wall. Like you mentioned, laminate may be too heavy and there is no guarantee that glue will hold. Vinyl is definitely a better option, since it is more light weight. Your best bet is to try installing a thin vinyl with a heavy duty glue. Please know, the warranty on your floor will be voided. We hope this helps! Can I install laminate flooring over paneling? Hi Ron, thanks for reaching out. If you are referring to wall paneling, that should be fine. Please make sure that the paneling is secured to the wall, and nail the laminate to the wall or paneling so you don’t have to worry about the laminate falling from your wall. Hope this helps! 7mm thickness of laminate flooring sufficient for walls? What’s the thickest you can use? Is there a double sided tape I could use INSTEAD of an adhesive? Hi John, thanks for reaching out. We have seen many of our customers install laminate on walls and it looks great! We recommend nailing the planks to a stud on the wall, using a nail gun on the locking edge. This way, you can be certain that each plank is properly mounted to the wall. We would not recommend using double sided tape. As far as thickness, there is no rule but we advise using a thinner laminate since it will be more lightweight. Please know, laminate is intended to be installed on the floor, so installing on the wall will void your warranty. Please let us know if you have any other questions! Can you tell me why I need to prime or paint new drywall? Hi Dennis, thanks for your comment. You can go ahead and install directly on new dry wall, or on a primed and painted wall. The blog post recommends not to install directly over wallpaper or paneling, and this is to ensure that the flooring is well attached to the wall. Thank you ! One more question, we are installing laminate on a concrete floor that has been ground down in spots to make level. Wondering if we also need to put plastic down under padding to keep dust from coming up from ground cement. Can I glue the laminate to a concrete wall? Great question, Jerry! Yes, you can glue laminate flooring to a concrete wall. You will need cove base adhesive, because it is formulated for quick grab and rapid set-up for faster, stronger installations. You can find this type of adhesive at any hardware department store. Happy installing!